I am SO excited to be partnering with the amazing PlanetShoes.com today for a truly incredible giveaway! I recently became the proud owner of a pair of their shoes (the Gentle Souls Blinique in Chocolate), and I can't even tell you guys how in love with them I am. They are crazy comfortable, the quality is impeccable, and they're one of the chicest pair of sandals I've ever seen. In addition to the fact that Planet Shoes carries thousands of gorgeous shoes (from over 160 brands! ), they also have a commitment to respect the earth, which is a pretty big deal in my eyes. Their mission is to find designs that blend function, style, and comfort with eco-ethics, and they work alongside several environmental organizations in effort to better our planet. I'm a fan. And now you have the chance to own a pair of your very own from their Gentle Souls line (my favorite!) - a $120 to $395 value - of your choice! To enter, just visit the Planet Shoes website and leave a comment below telling me which pair of Gentle Souls is your favorite. That's it! This giveaway is open through March 6th and is open to all Bubby and Bean readers who live in (or can have their prize shipped to) the U.S. and Canada. The winner's name will be randomly chosen and announced shortly after. 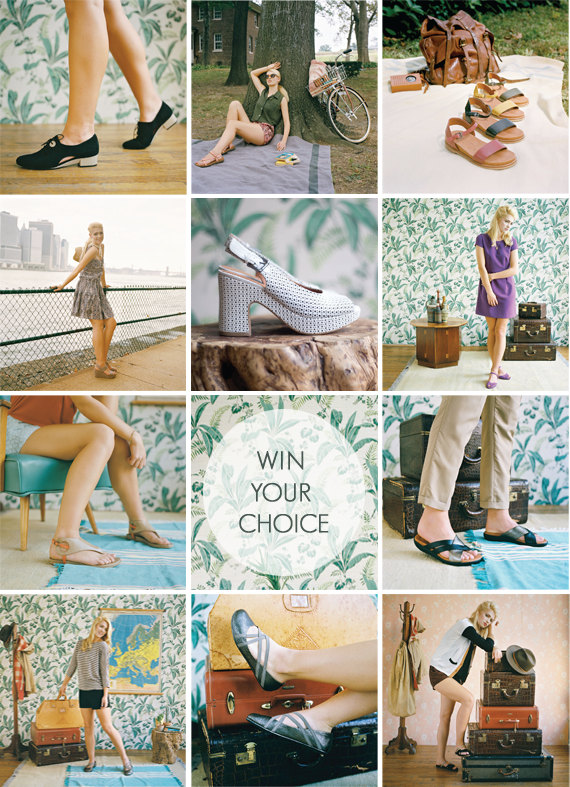 Thank you again to Planet Shoes for offering our readers the chance to win a pair of their amazing shoes! GOOD LUCK! Wow! What great shoes! They're really gorgeous and I love the company's philosophy! I especially love the Unique pair in black. The Podential boots are calling my name but I'd be happy with the "Hey Gabe" sandals! Thanks so much for the opportunity! I like Planet Shoes on FB as Katy M.
I follow Planet Shoes on twitter as @katygmorris. oooh the Gentle Souls Lily Moon in teal or red are beaaautiful! I would love the Gentle Souls Lone Eagle, they look like the perfect combination of comfort and fashion! I follow them on Pinterest as katygmorris. Gentle Souls Lily Moon in Teal are adorable! Wow I love the Gentle Souls Warm N Cozy, cute, comfy looking yet very practical. Liked the post on Facebook too! I love the lilly moon in blue! I Clicked the Facebook Like button below to like this post on Facebook. I follow planet shoes with username justByou. I like the june flower sandles. I would wear these lovely shoes all the time! I love the Lily Moon shoe! I followed planet shoes on twitter. The Lily Moons are ADORABLE. In red please! Following Planet Shoes on Pinterest! This is an AMAZING giveaway! I love the Gentle Souls Bistro shoe and the Gentle Souls Bless Word and so many more! 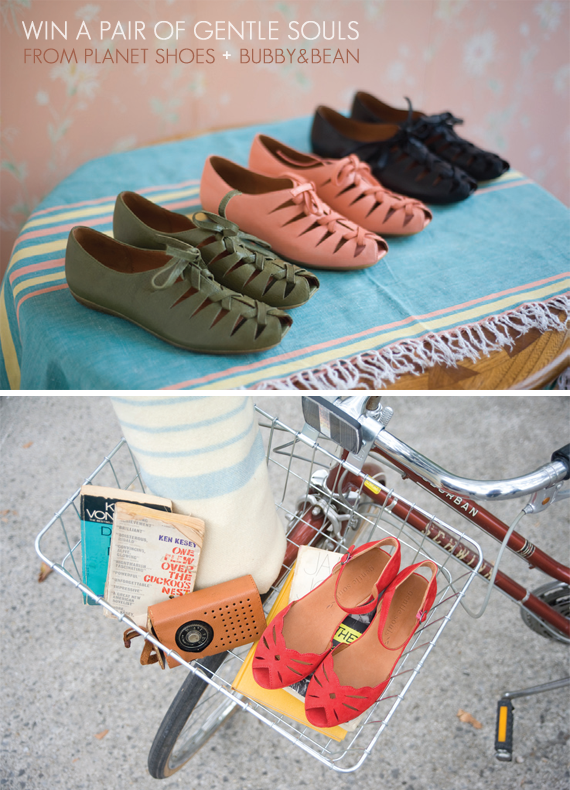 I'd have to go with the Birkenstock Mayari Birko Flor. I think my favorite is It's So Fun in Gunmetal! I love the Gabby and June Flower the best, but they're all perfect! Thanks so much! I like Planet Shoes on FB. Thanks! Following Planet Shoes on Twitter (I'm gogorabbit.) Thank you! Following on Pinterest, too! Thank you! LOVE the It's So Fun in Gunmetal! Those are awesome and would make for fantastic work shoes when I'm running around coordinating weddings. I love the break my heart ones!! They will be perfect this spring and summer! Hurry up warm weather!! They make me think of my fantasies of being an artist living in a light-filled loft in Paris. My imaginations runs way sometimes! In love with this brand! The Bay Braid is my favorite! I've been wanting them for a while now! I like this post on FB! I must say the Gentle Souls Blinque in chocolate is my fave. Can't wait to rock them at all the shows this summer! I liked Planet Shoes on FB! I like Lily Moon in Teal! I love the Gentle Souls Up At Dawn! I Liked Planet Shoes on FB. I follow planet shoes on pinterest! I clicked the like button below for facebook! I love Gentle Souls Blinque, they're so minimal! I liked Planet Shoes su Facebook. I followed Planet Shoes on Pinterest. I pinned one of the pics on Pinterest. I liked this post through Facebook. It's not easy to choose, but how about Gentle Souls Bless Word. I love the Blinque and the Lily Moon! Oh lord. All of them are extremely hot. I'd get the Lily Moon. Gentle Souls Bay Unique are hot, but really ..I haven't seen a pair I don't like. I like Gentle Souls It's So Fun! They look comfortable! I Like Planet Shoes on Facebook. I Follow Planet Shoes on Twitter. I Follow Planet Shoes on Pinterest. I love the pair in the first photo shown in this post, but i couldn't find them on the web site. So Im just going to say I also like Gentle Souls Warm N Cozy in brown! I am droling over those boots! Ooooh that's so hard to choose! I think if I had to choose, I would pick the Unique shoes in the grey suede. I like the opportunity shoes, as well as lily moon. I'm lovin' the Bayside in Pewter. Thanks for the giveaway! I love the Gentle Souls Lily Moon in red shoes. I would love a pair of Chacos! Those are my favorite and I've been wanting a pair for soooo long but I can't afford them!! Ahhh I want to win! So many good ones! I like the Lily Moon & Break My Heart, among others. I love the Gentle Souls Blinque in black leather! All of their shoes are amazing! i love the lily moon! i repinned "APPLE, PEAR & CINNAMON MINI PIES"
I love the Gentle Souls Bay Braid shoes! I like Planet Shoes on Facebook (FB name: Madeline Brubaker). I follow Planet Shoes on Twitter (@shala_darkstone). I follow Planet Shoes on Pinterest (http://pinterest.com/shala_darkstone/). I "like" this post on Facebook (FB name: Madeline Brubaker). following planet shoes on pinterest as Jasanna! I like the Rupert Fine. It would be a miracle if I could find shoes that don't hurt my feet. Since I broke my foot a few years ago, it has been impossible to get the right fit and comfort level. My favorite pair is Gentle Souls Lily Moon in teal. I just love them. The yellow go mingle is super cute!